Daughter of Alpha, the mysterious leader of the Whisperers, Lydia was cloaked in zombie skin sent out with her companions to dispatch Jesus' group under the cover of average Walkers. 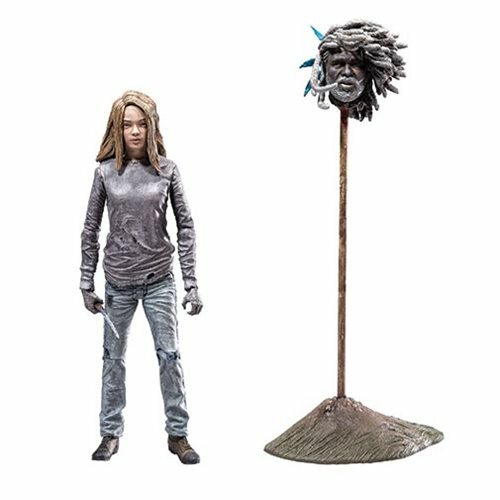 The Walking Dead Comic Series 5 Lydia Action Figure features Lydia dressed in her walker hide, a key attire to the Whisperers. Standing at 5-inches tall, the figure comes with 22 points of articulation, an alternate walker hide head, a knife, and a severed Ezekiel head on a stake with base. Ages 12 and up.